It’s no secret that craft beer continues to thrive and grow throughout the state of Oregon. Breweries and beer trails can be found across the state, including right here in our neck of the woods with the North Coast Craft Beer Trail. 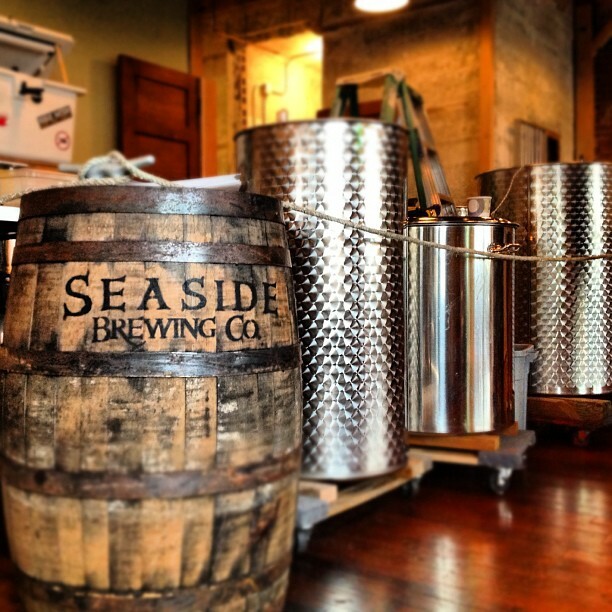 The passion for creating liquid goodness moved locals Jimmy Griffin and Vince Berg to open Seaside Brewing Company in June of 2012. They simply wanted to create a spot where they could put their passion to good use and ultimately share that love with everyone walking through the doors of a building that was built in 1914. The premises, which now serve daily lunch and dinner, and of course beer (more on that in a moment) once housed City Hall, Seaside Fire and Seaside Police (including jail cells – one of which you can have your picture taken in). As Griffin puts it, the building has “a lot of soul.” And it’s the soul of that building they wanted to showcase and preserve. A vault on the second floor has been there for longer than anyone can remember and the owners have tried to preserve as much of the past as possible throughout the structure. Taking a step inside feels like you are transported back in time. I recently witnessed the small-batch brewing process with Berg and co-brewer Todd Lippold. For these local brewers, craft brewing is a delicate balance between science and fine art with a healthy dose of imagination and inspiration. Observing them brew is akin to watching two artists at work in a studio. They toil, test, and consult in the middle of the lunch crowd. Watching their small-batch process is a fascinating way to spend an afternoon or an evening. Seaside Brewing Company is not the only watering hole on the block either. It is joined by The Wine and Beer Haus, Dundee’s Bar & Grill, U Street Pub & Eatery, The Bridge Tender, Beach N’ Brew, The Irish Pub at McKeown’s, Relief Pitcher Tavern and many others – all great places to enjoy the company of friends or family.